The Undying Monster is a 1940s old dark house mystery concerning a family legend about a werewolf. It was directed by John Brahm, who also did two much better movies in the “gaslight” thriller genre in the 1940s: The Lodger, and Hangover Square. All three came together in the same boxed set, which is how I got hold of this less well-known work of his. After an opening voice-over that introduces the legend of the Hammond Monster and sets the story we are about to see in 1900, the movie takes us around the interior of an old mansion somewhere on the English coast. The clock is striking 12 and chords of ominous music play. We end up in the drawing room, lit only by the fire in the fireplace. A woman’s arm is seen dangling limply over the edge of the sofa. An enormous Great Dane lies sprawled on the carpet. Are they both dead? Victims of the Monster? No–it’s just a little directorial fake-out. The butler comes in a minute later and both the dog and the woman wake up. “I must’ve fallen asleep,” the latter says apologetically. This young lady is Helga Hammond, who was waiting up for her brother Oliver’s return from the laboratory of a doctor friend who lives nearby. Oliver isn’t usually out this late. There is some conversation about poachers on the family estate and the butler quotes an old poem about the Hammond Monster: When there are “Bright stars, frost on the ground” (as there are on this particular night), “beware the bane on the rocky lane” (the path Oliver is most likely to take home). The Hammond siblings’ grandfather died on the cliff path along the sea coast 20 years ago–after seeing the Monster, the butler maintains. Helga scoffs at the old family legend. She believes her grandfather killed himself. She doesn’t seem very worried about her brother, even after the Great Dane barks at something outside before running away into the frosty night, but she does telephone the doctor to confirm that Oliver did leave his house some time ago. She is about to go up to bed when a dog or wolf is heard howling in the distance. So, have you ever been watching The Wizard of Oz and find yourself looking at the Tin Woodsman and thinking, “Mm–that Jack Haley. I’d like to see him naked holding an armload of adorable black kittens.” No? Me neither. But if there’s somebody out there that’s had that thought, then I’ve found a movie for you. One Body Too Many is a 1940s comedy that plays with the standard formula and tropes of those Old Dark House movies I’ve been hunting down during the last few years. Haley plays Albert Tuttle, a nerdy but ambitious insurance salesman who has an appointment to sign up a new client, Cyrus Rutherford, an eccentric millionaire so obsessed with astrology that he’s built an observatory on top of his mansion. What Albert doesn’t know is that his prospective client has no need to buy life insurance; he’s just dropped dead. We cut to the familiar old scene of the family gathered at the mansion to hear the reading of the will–only, it isn’t a will. Cyrus Rutherford’s lawyer instead reads a preamble to his will, which leaves amounts from $50,000 to $1.50 for cab fare to the various people in the room–Rutherford’s sister and her husband, a collection of nieces and nephews, the astrologer who helped Rutherford design his observatory, the housekeeper and butler. (This last is played by Bela Lugosi, who doesn’t really get much to do in this movie besides play out a running joke by offering everyone cups of coffee which the viewer has reason to believe he’s poisoned to get rid of “all the rats.”) The preamble to Rutherford’s will also features some snarky comments about these people so that we get some quick sketches of their characters and can sort out the nice ones from the nasties… for the most part, anyway. According to the terms of the preamble, Rutherford’s coffin is to be placed in a glass vault on top of the observatory so that he can always gaze up at the stars. This vault will take a few days to be built. No one can leave the house before then without forfeiting their inheritance. Once the body is in its final resting place, the will will be read. If, for some reason, the body isn’t placed in the vault according to Rutherford’s wishes, then the terms of the will will be reversed–that is, the people who were to receive the largest amounts of money will get pocket change and the original recipients of the small amounts will be rich. At this point, no one has read the will and don’t know what they are going to inherit, but from the snarky remarks in the preamble we can all guess who Rutherford did and didn’t like. As a little girl in the early ’70s, I would come home from school every day and turn on the TV to watch reruns of what we called “Barnabas Collins,” the show about the vampire. I don’t recall very much about the show itself, however, except that one featured character named Maggie was played by an actress named Kathryn Leigh Scott–a name I am unlikely ever to forget or misspell. 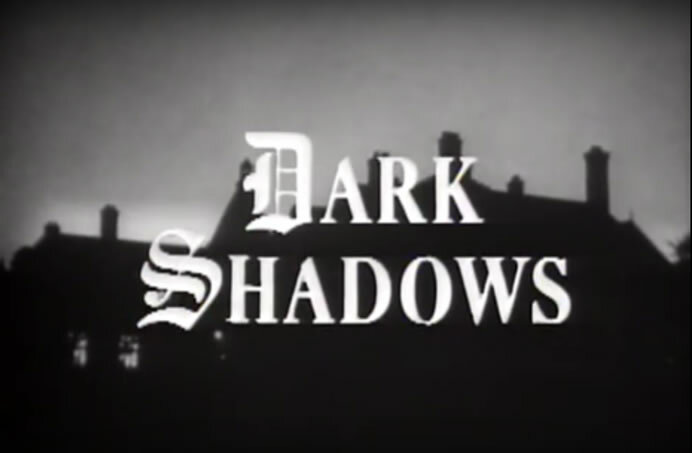 Nor can I say that I gave the show much thought in the last 40 years, until the first 200 episodes of Dark Shadows from 1966 and ’67, before the appearance of Barnabas Collins, became available on DVD in the wake of that very silly film remake. The original concept for the show sounded like the sort of Old Dark House movies I’ve taken an interest in lately, atmospherically spooky and not so overtly supernatural as it later became. I thought I’d rent the first two sets of disks from Netflix and give it a look. The first episode begins promisingly with a night-time view of a neo-Gothic house on a hill and a woman speaking in voice-over, at once evoking both The Haunting and Rebecca. When the young woman speaking is introduced, her story also seems vaguely Jane-Eyrish. Her name is Victoria Winters (as she will announce at the beginning of nearly every subsequent episode). She was abandoned as an infant and has grown up in a New York orphanage. The only clues she has to her background are a note that was left with her as a baby, bearing her first name, and anonymous envelopes containing money for her care which have been sent regularly from Bangor, Maine, over the past eighteen years. Vicky has just received a job offer from a woman named Elizabeth Collins Stoddard of Collinsport to be a governess to her nine-year-old nephew. Vicky has never heard of the Collinses or Collinsport and has no idea how Mrs. Collins Stoddard has come to know about her, but Collinsport is only 50 miles from Bangor. Vicky has accepted the job in hopes of solving the mystery of her own past. We meet her on a train headed for the little coastal town. The Terror‘s story begins with two career criminals named Joe Connor and Soapy Marks (the latter played by Alastair Sim) who have just participated in the theft of a large shipment of gold in transit between Paris and New York; before they can enjoy their ill-gotten gains, however, they are betrayed by their unseen third partner-in-crime, known to them as Micheal Shea. It’s Shea’s phone call to the police that leads to the arrest of Connor and Marks, while he keeps all the gold for himself. Ten years in prison give Connor and Marks more than ample time to think about revenge. The police, meanwhile, are still searching for the gold, which has never been recovered; they believe that the two about-to-be ex-cons know more about its whereabouts than they admit. Marks and Connor don’t know, but they do have some idea of where to hunt for Shea once they’ve been released. Last year, when I was taking an interest in Old Dark House movies, I ran across this title. Based on a stage play, it’s the story of a killer dressed in a bat costume who terrorizes the inhabitants of an isolated country house. Sounded like just the sort of thing I was looking for! A silent version was made in the 1920s and another, presumably talkie version, in 1930. These earlier versions were not available on DVD, but since this 1959 remake starred Vincent Price and Agnes Moorehead, I thought it was worth a look. Moorehead plays Cornelia Van Gorder, a writer of murder mysteries who has rented a country house called the Oaks for the summer from the bank president of the nearest town. The bank president, Mr. Fleming, is away vacationing in a cabin in the woods with his friend, the local doctor. Miss Van Gorder just happens to be at the bank, meeting the nice young cashier who’s been left in charge and his nice young wife, when over a million dollars worth of bonds and negotiable securities are discovered missing.